Here's your chance to win a Ford EcoSport ! Here is your chance to win a Ford EcoSport. Ford India has come up with a unique campaign which could make you win a brand new Compact SUV, we also say a similar kind of competition on Ford's Figo and at the end a winner was declared. All you need to do is register yourself to Ford's "EcoSport Urban Discoveries" campaign wherein you need to register yourself and follow the below mentioned steps. Sign up for the contest here. 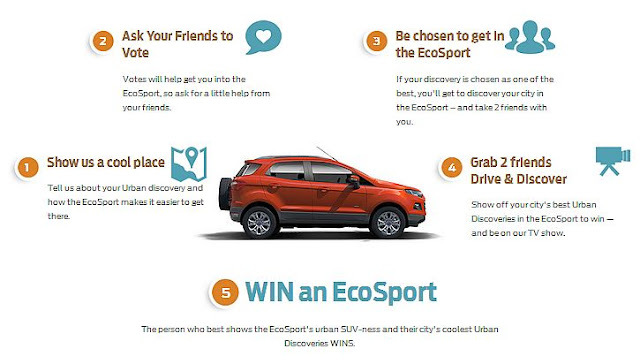 Mention a cool place in your city by posting about it on EcoSport discoveries website. Market this campaign onto your various social accounts - Facebook, Twitter etc. Make your friends like your post. If your "coolest place in city" gets popular enough to be taken to next level, Ford India will inform you. Ford India will then send you and chance to take your two friends along to that place in an EcoSport. You will also be accompanied by a Video Crew and your video will be showcased on National Geographic Channel. The one with maximum votes will then win the campaign and will win an EcoSport.